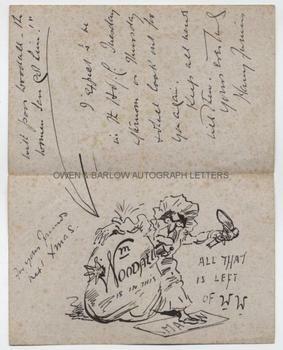 HARRY FURNISS autograph letter Signed with drawing. British (English) artist and illustrator. ALS. 3pp. 23 St Edmund's Terrace, Regent's Park, N.W. 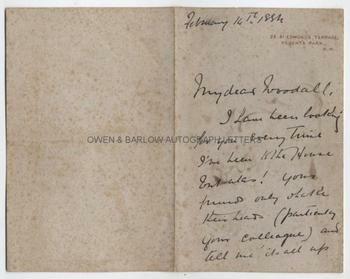 February 14th 1884. To [William] Woodall. 8vo. Approx 7 x 4.5 inches. Some foxing else near fine. Harry Furniss was one of the best loved of Victorian illustrators. His drawings appeared in the Illustrated London News, the Graphic and Punch. He was also noted as a book illustrator, including his work for Sylvie and Bruno by Lewis Carroll. His caricatures of politicians were one of his specialities and he was often to be found in the Public Gallery of the House of Commons with his sketchbook in hand. Harry Furniss was a close friend of William Woodall and had accompanied him on a tour of the Dolomites in the 1880s (see Furniss's book 'Harry Furniss At Home' 1904). William Woodall, a radical Liberal, became leader of the Womens' Suffrage Party in the House of Commons in 1884. He unsuccessfully introduced several Bills seeking votes for women. It is, no doubt, his involvement with this group that was taking so much of his time at the date of this letter and which Harry Furniss is gently lampooning.